The Rolex Day-Date, otherwise known as The President, has been the flagship offering from the brand for the last sixty years. It took over the mantle from the Datejust which was released a little more than a decade earlier. Our Rolex Day-Date President guide details why it is forever positioned as stubbornly elitist. It was only available in nothing but the finest precious metals. Not so much as a half-and-half Rolesor version sullies all that gold and platinum. Like its forerunner, the Day-Date was a revelation on its unveiling. Yes, the Datejust debuted the first ever date complication on its dial. But, the President became the first to display not just the day of the month, but also the day of the week spelled out in full in a separate window above the 12 o’clock index. It was coupled with Rolex’s two other groundbreaking innovations. First, the Perpetual self-winding movement. And second, the tight-as-a-drum Oyster case. As a result, the Day-Date became an immediate symbol of aspiration and success. Even today, it has stayed an undeniable icon. No doubt, it’s the first stop for many who have achieved their wildest ambitions. Also, it has become so renowned it has crossed the generational divide. It may once have had the reputation of adorning only the wrists of sober bureaucrats and functionaries haunting the dark corridors of power. But today you are just as likely to see one complementing the outfits of leading sportsmen and women, youthful music moguls or Hollywood royalty. To accommodate the eclectic tastes of all, the brand released the model in a baffling array of get ups. These range from the low-key and subtle to the gaudy grandstander. It also includes a vast range of dial colors, bezels, metals and different hour markers. The modern Day-Date also comes in a choice of 26 languages for its day of the week complication. To open it up even more, the latest series has introduced a choice in sizes—the time honored 36mm, and now a 40mm companion designed to appeal to a more contemporary audience. And securing it all is another innovation. It’s one designed specifically for the Day-Date (and from where it picked up its unofficial nickname). The President bracelet is an amalgamation of Rolex’s two other metal bands, taking the flat three-link design of the utilitarian Oyster and turning them semi-circular, as in the Jubilee. For the generations it has been in production, the Day-Date has always been a classic expression of elegance. There are few models that have changed less over time, even by Rolex standards. It is an ageless design with an unending appeal—the number one offering from the world’s leading watchmaker. Read on below to discover how you can make this horology legend your own. The nature of the Day-Date, with its focus on only the more opulent end of the watch buying spectrum, along with its relatively complicated functionality (for a Rolex anyway) means its early buy-in price is higher than that of many other of the brand’s offerings on the pre-owned and vintage market. With no steel or even Rolesor to soften the blow, you can expect to be parting ways with north of $6,000 at a minimum to get yourself a wearable Day-Date. So what does that sort of outlay buy? You will easily be able to find a pristine example of the President’s longest-running and most famous reference, the ref. 1803, a watch that emerged in 1961 and is, for many, the archetypal edition. This was the model that introduced the endless varieties of dial choices and, post-1969, brought in the trademark hidden clasp on the watch’s bracelet. It was also the reference that earned the Day-Date its commander-in-chief moniker, when Lyndon B. Johnson was pictured wearing his. You will find the majority at this level are sitting on a fine leather strap, a non-typical preference for a Rolex, but one that is still offered as a factory-fitted option in the current lineup. To secure an example on its eponymous gold bracelet, you will need to budget for an amount that just creeps into five figures. At this price point, you will also start seeing the first of the diamond-enhanced models emerging, either on hour indexes or bezels or both. At the other end, especially rare pieces or platinum models swathed in precious gemstones on every surface, either by the brand itself or as an aftermarket addition, can reach well into six-figure territory. The question is really how much you would like to spend. There is a Day-Date out there to suit everyone’s tastes. However, the least expensive examples are still priced higher than some others in the Rolex collection. Yet, it is a watch, and a watchmaker, that will hold its value at the very least. If you were looking to buy one as a possible future investment however, the sheer numbers in which the standard Day-Date has been made over the years means it has never performed particularly well as any kind of appreciating asset. Taking ownership of one of the few limited edition pieces, such as the 60th anniversary model with its green dial, calls for a healthy checkbook in the first place. And, it is a potentially expensive gamble on how well it will do in the future. While it misses out on the steel version that made the Datejust about the most versatile of all Rolex’s designs, the Day-Date is still available in an almost uncountable number of variations. Like the Datejust, it is something of a chameleon. It can be either a toned-down and subdued companion or, in another guise, an extravagantly colorful showman. It all depends on the personal sensibilities of the wearer. The classic Day-Date look will always be the 18k yellow gold, complete with champagne dial and simple baton indexes. It has been an option in the range from the very first reference, the ref. 6510, and continues to be the model that is most identifiably Rolex. Today, you will still find more yellow gold examples on the vintage market than any other. Accompanying them, and still plentiful, are the other pair of gold alloys, red and white. Each has a dramatic effect on the overall look of the watch. The chocolaty warmth of Rolex’s red, or Everose, gold brings a subtler, more understated aesthetic, while the white gold pieces are perhaps the ones most adaptable to different situations and outfits. At the absolute top end is the unbridled luxury of platinum. It has a luminosity unlike any other and is one of the densest and heaviest metals in the world. Although many assume there to be very little to choose between it and white gold, in the flesh, you can see nothing shimmers quite like platinum. Rare and extremely difficult to forge and polish, they make up some of the most expensive examples of the Day-Date you will find. The dials, the element that gives the watch its personality more than anything else, have been issued in just about any color you could wish for, from traditional black and white to the lurid garishness of the 70s Stella dials (we’ll look at those a bit later). As well as the different colors, the Day-Date has also had faces crafted from some extraordinary materials over its lifetime. If the rainbow-like iridescence of mother-of-pearl is not quite exclusive enough for you, there is another option that is literally out of this world. The early 2000s gave rise to President models fitted with dials formed from thin slivers of the Gibeon meteorite. These slivers are from an actual shooting star that fell to earth as far back as three million years ago in Namibia. Each one is completely unique. And, with the Namibian government slapping a ban on any more of the meteorite being removed for any purpose, the models that exist now are going to be the only ones made. The bezels also have a number of options, from polished flat or fluted surrounds to those set with Rolex’s diligently hand-selected diamonds. As for the range of bracelets, you can choose between the specially created three-link President, the elegant solidity of the Oyster or one of the brand’s beautifully supple alligator leather straps. During the 80s, one notable variation did emerge. Known as the Tridor, it is a standard President bracelet where the outer links are made from 18k white gold, but the center links are made up of a blend of white, red and yellow gold, running in stripes down the middle. It is an option not offered anymore, and has an especially eye-catching look. The one other big decision to make before pulling the trigger on your Day-Date purchase is in what language you would like your day of the week written. Originally issued with a choice of 11, today you can take your pick from a total of 26. It will, of course, depend on what your native tongue is. Although, if you don’t speak English, French, Spanish, German, Italian, Greek, Danish, Dutch, Basque, Catalan, Finnish, Hebrew, Arabic, Ethiopian, Indonesian, Chinese, Japanese, Latin, Moroccan, Farsi, Turkish, Portuguese, Polish, Russian, Swedish or Norwegian, you will either have to look elsewhere. Or else, just commit to learning seven new words! Rolex originally launched the Day-Date, like most of Rolex’s dress watches, as a 36mm model. They considered this the ideal male size for most of the latter half of the 20th century. Anything bigger than that was strictly for tool watches, which needed the extra bulk to lend an inherent strength. Even in the modern range, there is a vast catalog of 36mm Presidents to choose from, but these days they have company. The shakeup began in 2008 with the release of the Day-Date II, a 41mm version of the age-old classic, with Rolex finally unable to deny the market trend tipping towards larger watches any longer. The effect of introducing a contemporary sized model of such an established and conservative name was as you would expect; it appealed to a younger, less button-down crowd, while causing a few raised eyebrows among traditionalists. However, it had only a short-lived and not terribly successful run. The main problem in the eyes of many were its proportions. Although the additional mils in its diameter were a step in the right direction, Rolex’s designers decided to also widen the trademark bezel while keeping the bracelet width the same, at 20mm. It meant the lugs became thicker by necessity and, coupled with the enlarged surround, gave the watch a bulk that lost all of the elegance of the original. The Day-Date II certainly had its fans, attracted by the idea of a more masculine-looking dress watch. But not enough to sustain the new model. 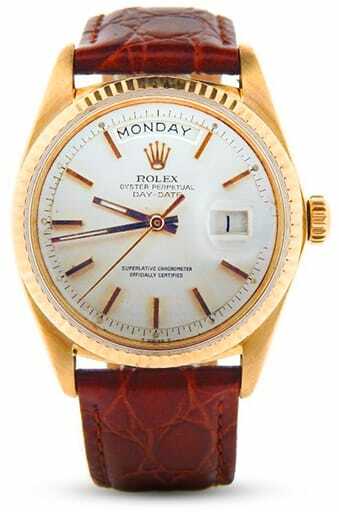 As a result, Rolex eventually discontinued it in 2015 in favor of the Day-Date 40. This version is very much just a scaled-up representation of the 36mm, one that preserves the refined profile and graceful lines but in a 40mm (you’ll be amazed to learn) case. It has already proven itself a hugely popular alternative, helped along by the inclusion of Rolex’s latest groundbreaking caliber, the Cal. 3255, with its ultra-efficient Chronergy escapement. The two models are still amongst the biggest sellers in the brand’s portfolio and, interestingly, are finding success with both male and female wearers. With more and more women taking to donning what would once have been considered exclusively men’s watches, the 36mm (known now as a mid-size) and the 40mm are becoming decidedly unisex. By the time the Day-Date was released, Rolex had built a reputation for making some of the most reliable and stylistically simple three-hand, time only watches you could buy. The occasional outlier, such as the Datejust and its revolutionary complication, was as complex and daring as the brand seemingly wanted to get. So when the Day-Date appeared, it marked another huge step forward. The double calendar function, with the day of the week written out in full, was a world’s first. The mechanism driving it benefitted from the decade or so of engineering progress that had been made perfecting the Datejust. That meant adopting the cam and jewel system that caused the date change to happen instantaneously at midnight, rather than as a gradual process starting two hours before and ending two hours after the stroke of 12, as in the earliest versions of its forerunner. And again similarly to the Datejust, the only modifications that have happened to the President since its debut have been to make the watch more accurate and more convenient. The Cal. 1055 that was brought in just a year into the production run introduced the Microstella regulating screws on its updated balance wheel which gained the Day-Date its COSC certification. Following that, the next major change took place in the 70s with the unveiling of the Cal. 3055. This not only brought the watch up to the modern Rolex frequency of 28,800vph, but also unveiled the convenience of the Quickset date function. Now, the day of the month, displayed beneath the Cyclops lens at the three o’clock position, could be adjusted independently via the winding crown, rather than having to spin the hour hand through an entire day. It would take until the late 80s before the next logical step was taken and the Cal. 3155 brought the amenity of a Double Quickset, where both day and date could be altered autonomously. Beyond that, there has never been much else needed doing to the Day-Date. Rolex has poured more than half a century of technical prowess inside it. This put each generation of the watch at the forefront of what is possible in terms of precision and resilience. It is a trend that has endured all the way through its existence. Also, it has long been the model against which all others with dual calendars are judged. Although by modern standards it may not be the most complicated timepiece in the world, it is comforting to know that whatever vintage model you choose, it represents the pinnacle of its particular era’s watchmaking virtuosity. Made only from the finest precious metals, the Day-Date has always been reassuringly expensive. As such, it has sold in slightly fewer numbers than its more accessible stable mates—but not by much. It has been in continuous production for well over 60 years now. It’s a highly popular and increasingly desirable addition. As such, there is no shortage of examples on the vintage and pre-owned market. Some, of course, are more prevalent than others. The aforementioned ref. 1803 is by far the most numerous and marks the usual entry point into the President owners club. Others are extremely rare, such as the 60th anniversary model with its green face. Or another limited release, the so-called Arabic dials. First appearing in the late 50s, references such as the ref. 6612B ‘Lone Star’ were created exclusively for the Middle East market. These pieces had the day and date both depicted in Arabic script. With the Islamic religion forbidding men from wearing gold, they were most commonly forged in platinum. It is a trend that has continued off and on throughout the Day-Date’s run. The brand made many of the watches as special orders for various Sultans. However, now they are starting to appear on the auction scene. They took a brief hiatus at the start of the 80s. But they made a stunning return in 2016 with another platinum example. These were fitted with an ice blue sunburst dial, complete with an entirely Arabic font. Another oddity originally targeted at the Middle East, this time from the 70s, are the Stella dials. They named them either in reference to American artist Frank Stella and his choice of an extremely vibrant palette. Or, they named them after the Latin word meaning ‘star’ (no one seems quite sure). But, they are a collection of Day-Dates with ultra colorful faces in a range of peacockish tints. Relatively few in number, the enamel dials proved quite fragile. So finding one in good condition is something of a challenge. But it could be well worth the effort in future investment terms. Like the Arabic models, the brand released a contemporary series with retina-threateningly intense dials, this time in 2013. Stella in all but name, they are, if anything, even more vivid than the originals. With its history stretching back generations, and its reputation as a watch destined to be worn by those of the highest social standing, there are some fascinating and highly collectible examples of the Rolex flagship to look out for. And, prices ranging from the surprisingly attainable to the truly incredible. 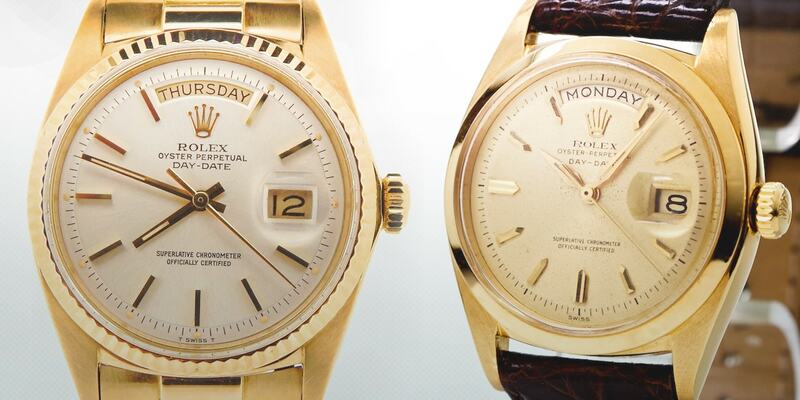 The Rolex Day-Date started life in 1956, with the refs. 6510 and 6511, and fitted with smooth and fluted bezels respectively. They were the first watches of their kind to display both the date and the day of the week. Also, Rolex crafted them only in gold. As a result, they instantly went to the head of the line as far as the brand’s status symbols were concerned. Yet, Rolex discontinued these debutantes after a very short trial run to make way for replacements with upgraded technology. This was not an uncommon occurrence with early Rolex models at the time. About a year after their launch, they gave way to the refs. 6611 (smooth bezel), 6612 (fluted) and 6613 (diamond-studded), complete with their new balance wheel and Microstella system inside the Cal. 1055, enabling the watch to gain the coveted certification from the Official Swiss Chronometer Testing Institute. Although this second generation was an improvement on the first, they themselves were also only in production for a comparatively short time. By 1959 the Day-Date had reached the most revered iteration of the watch, the 1800 series. It is this family, and in particular the ref. 1803, that gained the watch much of the reputation it enjoys today. In the mid-sixties, for example, it was an 1803 that earned it its nickname through its association with President Johnson. He wasn’t the first commander-in-chief to own a Day-Date however. Marilyn Monroe gifted one to JFK following her notorious rendition of ‘Happy Birthday, Mr. President’ in 1962. Kennedy, fearing a scandal, ordered an aide to get rid of it. But the watch surfaced at auction in 2005 and sold for $120,000. With the groundwork of the watch now set, Rolex went about their usual business of constantly fine-tuning the inner workings while leaving the accepted and well-established aesthetics well alone. The original Cal. 1555 movement of the 1800 series was swapped for the higher beat Cal. 1556 around 1965. Rolex increased the balance frequency from 18,000vph to 19,800vph. Then in 1972, Rolex introduced the hacking feature. The hidden clasp on the President bracelet featured first in 1969, just about the last major change to the watch’s outward appearance. The 1800 series stayed in production for about 20 years, clocking up countless different variations in dial, bezel and metal combinations. In 1977, Rolex introduced the third wave, the ref. 18XXX series. As well as replacing the plexiglass with a sapphire crystal, it brought the convenience of a Single Quickset feature to the watch, with the Cal. 3055. This was the first of Rolex’s signature high-beat ovements. 11 years later, the Cal. 3155 completed the puzzle and included a Double Quickset mechanism to adjust both calendar functions independently. The watch’s current collection arrived in 2000 with the six-digit ref. 118XXX series. These were still as illustrious as ever. They graced the wrists of everyone from heads of state to hip hop moguls to the world’s greatest sports figures. Rumor has it, the Dalai Lama is also a fan. As a diverse client base goes, there are few models to rival the Day-Date. 2008 brought us the increased size but disjointedly proportioned Day-Date II, with its 41mm case, but it proved too much of a departure for the faithful. It was binned in 2015 for the much more acceptable Day-Date 40; the extra millimeter not making much of a difference, but the classic lines restored. Today, the favored timepiece of some of the most influential, notorious and accomplished figures of recent times is as widely admired as it has always been. A design that is part of the horology landscape, powered by movements that have long represented the peak of engineering excellence, it remains as relevant and as desirable as ever. The pre-owned and vintage market gives the opportunity to own a watch with one of the most impressive pedigrees of any. Plus, at a price that is surprisingly affordable.